The 16th Annual Clagett Regatta at Newport RI was a fantastic success for a number of reasons. 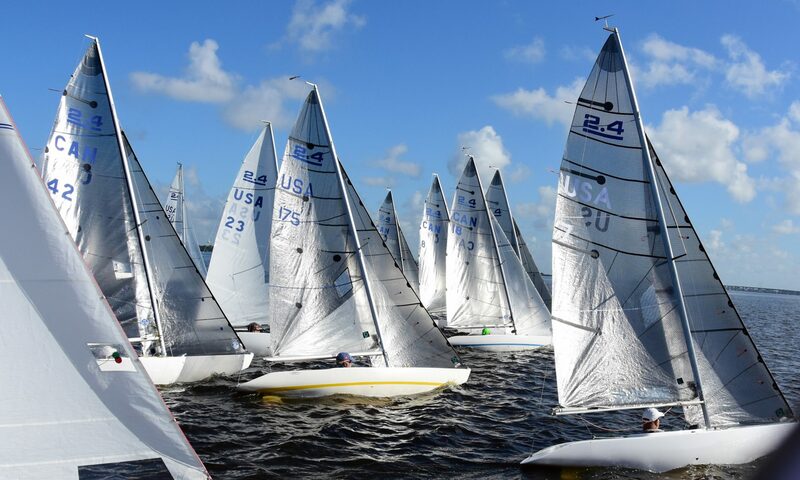 23 boats participated in the 2.4mR Class, a record number for this event. Entries were from Puerto Rico, Canada and the United States. Entries included four sailors under the age of 25 (three from Canada) all young women. Delani Hume-Lawrence from Victoria placed 8th and won the coach’s award for most improved sailor while Shaylagh Ley from Ottawa placed 22nd and won the Sportsmanship Award. Both of these sailors are sailing Clagett Program Boats donated for their use for up to four years. The inaugural Pacific Coast 2.4mR Championships were held June 16 & 17 at Royal Victoria Yacht Club with 11 boats in attendance. The boats attending were from Seattle and Calgary as well as from our Victoria fleet. The class anticipates that this will become an annual fixture on our regatta calendar and hopefully will attract more boats from western North American. Pointe Claire Yacht Club will be hosting the Canadian 2.4mR Championships August 10 -12th. The Notice of Race and entry forms can be accessed by clicking on the event title in the events schedule of the 2.4mR website. Racing starts at 1:30pm on Friday August 10 allowing competitors to work a full day Thursday and get to the regatta site with time to rig on Friday morning. The trade war between the Trump Administration in the United States and the Government of Canada is unfortunately impacting members importing 2.4mR sailboats from the United States. Sailboats with or without auxiliary power (tariff item 8903.91.10) will be subject to a tariff of 10%. This is in addition to the HST (or GST) which applies to all goods. Unfortunately consumers are the unspoken victims in these trade wars.